MrC’s celebration continued over his birthday weekend, when we went out to lunch with his side of the family. 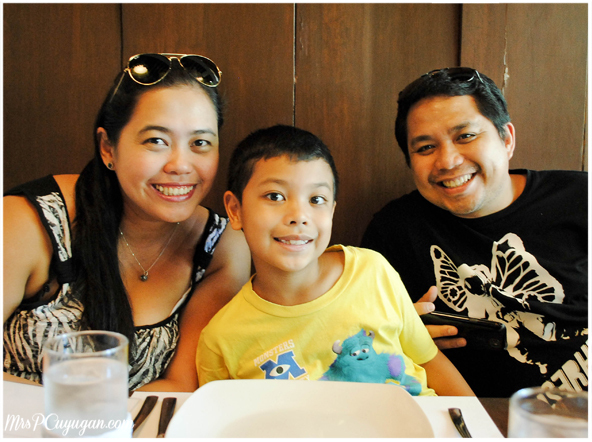 Since the little boy had been feverish that week, we decided to just pick a restaurant that was close to home. Commercenter was actually a great idea for Sunday lunch because the place is pretty quiet and we didn’t need to contend with the usual weekend mall crowd. 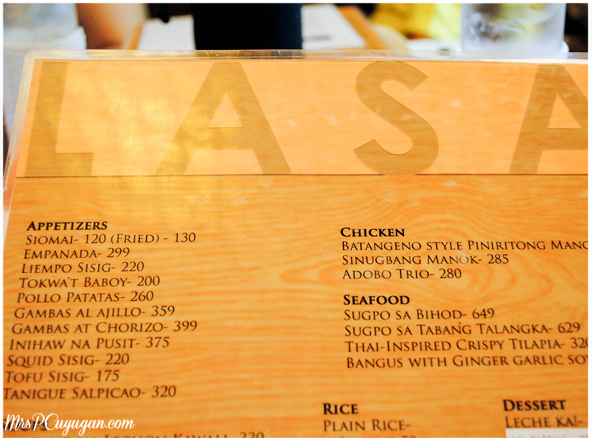 We decided on Lasa since my sister in law and her husband really love Pinoy food, and the boys and I had been wanting to try the place out also. I first read about this place in Southern Living, and then I saw it again a few weeks later on Jane’s Blog. I found it really cute and interesting that they served Puto as appetizers. When we got to Lasa, I noticed right away that the restaurant gave off this old Filipino home vibe, complete with heavy wooden furniture, crocheted glass cozies, and wood and capiz ceiling accents. 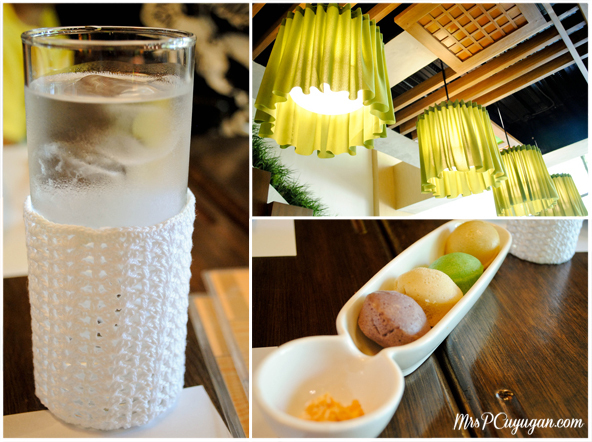 The puto that the server placed on our tables added even more Pinoy homey-ness to the ambiance of the place. Feels like your lola’s house, right? I let my lunch companions take care of the ordering this time, because I wasn’t really craving for anything in particular. One thing I made sure to order thought was a nice cold watermelon shake. It was extremely hot that week, so I really wanted to order something to cool myself down. 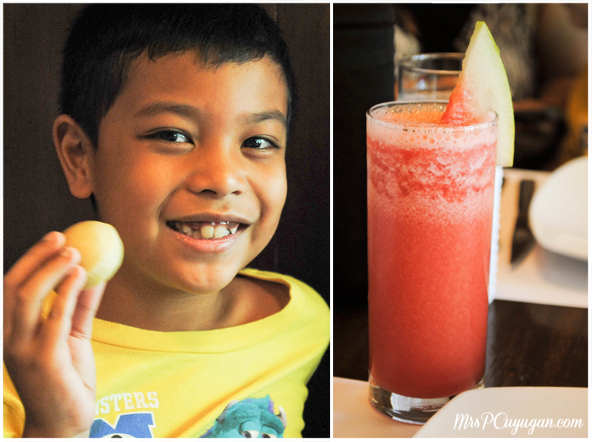 This boy loved the puto, and I super enjoyed that drink. I also made one other request, for my favorite Gising Gising. I can’t remember when and where I first tried this dish, but I remember falling in love with it at first bite. Ever since that first time, I’ve made sure to get this as my vegetable order at every Filipino restaurant we visit. Lasa’s version was a bit different from the others that I’ve tried. I’m not sure why the sauce is orange, but it is nice and spicy and just so good. 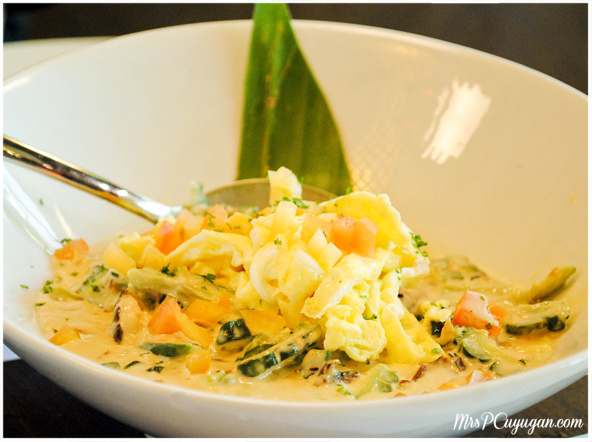 Lasa serves Filipino favorites with a twist. 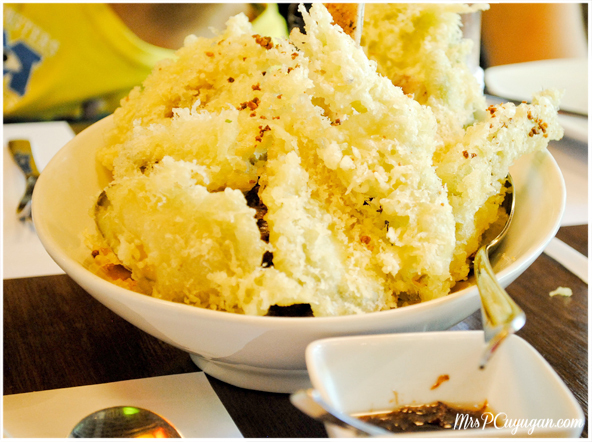 One very good example of their unique take on our local cuisine is the Kare-Kareng Crispy Tadyang. I’m pretty sure I’ve had crispy kare kare before, but I’m also sure that the vegetables in that dish weren’t breaded, tempura style. I think the presentation really set Lasa’s version apart from the rest. That, and their bagoong, which was super duper good. We also ordered Ampalaya and Tinapa, upon special request of MrC’s former nanny, who has been with the family for so long that she’s practically an aunt to us and an additional grandma to Little MrC. I must admit that I didn’t try this because I really do not like ampalaya. It got super rave reviews from the others, though, so if it’s something that you would be interested in trying, I say go ahead and order it! While I always order gising gising, I noticed that my sister in law often requested for Sugpo sa Tabang Talangka. This really wasn’t the first time, and I was happy when she said that she wanted to try this dish because it really sounded so yummy. And nope, it didn’t disappoint! We thought that we had ordered enough, but midway through the meal we realized that we needed one more viand. After a quick menu check, we all decided that it was Crispy Pata that we wanted. Now, I believe that you can’t go wrong with crispy pata. 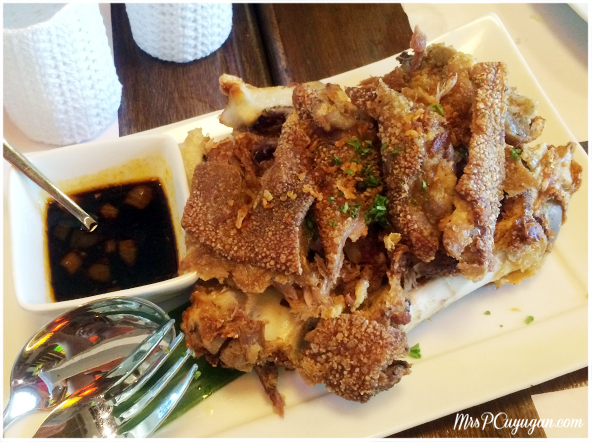 There is no bad crispy pata, just good and super good ones. This one was super good. 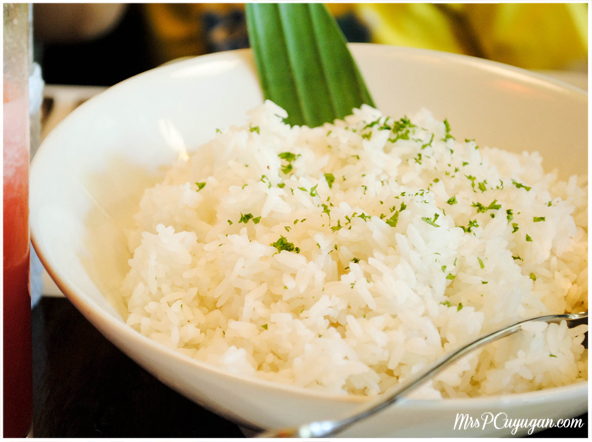 And of course, no Filipino meal is complete without yummy, fluffy steamed rice. We had two of these, plus another extra cup. Yes, we were hungry, and the meal was really just so good. For the first time ever, I was too full for dessert. We did go next door for some coffee though, and to hang around and chat for a while longer. Mr C’s sister lives quite far from us, so we really make the most out of our time together whenever we get the chance to meet up. I’m excited to go back to Lasa to try their other dishes. I know I’ll be spending a lot of time at Commercenter over the next few weeks, so I’m pretty sure I’ll get to eat here again soon. Maybe I’ll actually be adventurous and try the ampalaya. What are your must-orders at Filipino restaurants? This post really got me hungry. Where is this located? The pinoy food looks really tasty here at Lasa. I’d love to try their puto. I love Gising Gising!! i first tried it in Lorenzo’s way.. Our must have’s are sisig, sinigang or bulalo.. The Gising Gising at Lorenzo’s Way is the best!!! Super fave ko yun. Wow…getting hungry with these pictures…mas lalo na in real? I missed eating out these past weeks. I don’t think there’s a Lasa branch here in the north area. I hope I can visit that restaurant one of these days. Their Crispy Pata looks uber crispy..
We always have crispy pata and sinigang na hipon in our table. All the food certainly looks sooo good! 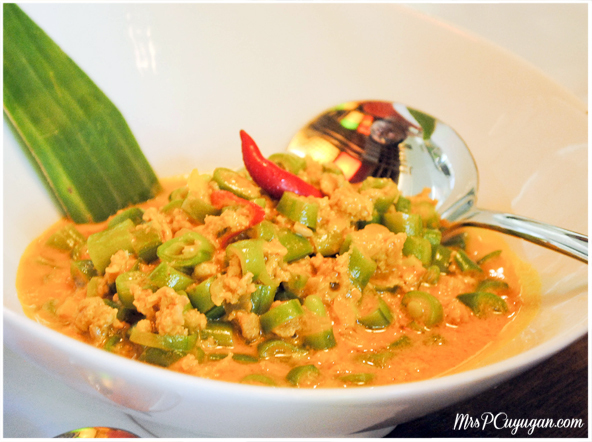 I’m a fan of kare-kare and this is certainly a new twist to that dish! Just looking at those photos made me crave for Pinoy Dishes already! esp. the Crispy Pata and Sugpo (quite expensive but looks really delicious). Belated happy birthday to your hubby! Oh my, with all those tasty dishes, my stomach is now growling like a hungry bear. I also like the ambiance..very homey. You had me at Crispy Pata. Haha! Jon will love it there. The crispy kare-kare looks interesting ha. I’ve never heard of a crispy kare-kare before. So cute naman the glass cozies! I rarely crave for Filipino food when going out, but the food here looks yummy! Like Madrasta, I love to try the Sugpo in Taba ng Talangka. The foods look so delicious, especially the sugpo but too pricey for our budget. Like what Kat said, P629 is already more than 1 kilo of sugpo here in Mindanao. 🙂 hehehe.. I miss dining out with the hubby. He’ll definitely love that crispy pata! Yumyum! Looks yummy. The place is charming. Honestly, the menu is quite expensive for my provincial budget. With P629, I can already buy more than a kilo of prawns here. Lucky us. 😀 Nice idea on the taba ng talangka. Hope to recreate that dish someday. Oh wow, fooood! I love Filipino food. And I keep reading about the popular “gising-gising” dish in many blogs but haven’t tried it yet. Now I’m really curious to try it! I’m glad that there are others who go to Commerce Center. I’ve been there several times and the place was dead. Anyhoos, belated Happy Birthday to Mr. C. I’ll try Lasa one of these days. My goodness, that sugpo in taba ng talaga is sinfully appetizing.